SYNOPSIS: In each episode of this Award winning series a Person Of Interest is given their previously secret ASIO intellifence file, and asked to respond to the allegations it contains. The four Persons Of Interest are Roger Milliss, Michael Hyde, Gary Foley and Frank Hardy. For forty years the Australian Intelligence & Security Organistion (ASIO) hunted spies and subversives. In the process it opened files on students, unionists, Aboriginal activists, and writers and as many as half a million other citizens. Persons Of Interest shows how things really happened in this dirty war against dissent. Using actual files, recently discovered secret surveillance film and photographs, these films are the personal stories of lives under the microscope of Government surveillance. In light of the Snowden, NSA scandal and with ASIO possessing more power than ever - Persons Of Interest is a timely addition to the debate. Length: 4 Episodes x 52 minutes. 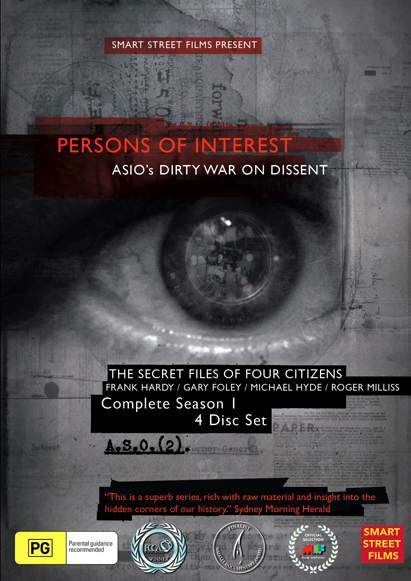 This is a 4 disc set and includes extra ASIO surveillance films, out takes and interview with Director. Also Appearing: Allan Hardy Marieke Hardy, Hon. Michael Kirby, Robert Manne, David McKnight, Mark Aarons, Suse Milliss, Kerry Miller, Darce Cassidy, Arthur Dent (formerly know as Albert Langer), Meredith Burgmann, Barrie Dexter and former ASIO Officers and agents. Reviews "This is a superb series, rich with raw materials and insight into the hidden corners of our history" Sydney Morning Herald. "An important additon to the cultural and political history of Australia." Walkley Award Citation. "Persons Of Interest is a milestone in Australian documentary." Beat Magazine. "This is the kind of fine grained study we need, Persons Of Interest ought not to be missed." Prof Robert Mann Latrobe University. "This outstanding documentary explains how liberty requires strict controls be placed on Government. Every Australian school child should be instructed in this story. It is a great Australian parable..." The Hon. Michael Kirby, retired justice of the High Court of Australia.